Lightweight magnetometer for airborne magnetic surveys using UAVs Modern Mag • Accurate, safe and reliable ground magnetic surveys. GEM systems sales. Airborne magnetic surveys using unmanned aerial vehicles (UAV) and lightweight potassium magnetometers. 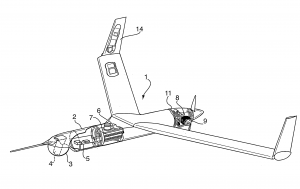 A magnetometer installed in the nose of a UAV. Airborne magnetic surveys using unmanned airborne vehicles need geophysical equipment that is lightweight. GEM Systems now sells an option for a lightweight electronics box case for the GSMP-35 “k-mag”. Optically pumped magnetometers have lightweight sensors, but the electronics boxes can be heavy due to the case material and thickness. Any internal frame that binds two electronic PCBs together are usually made of thick brass. GEM Systems now sells GSMP-35 potassium magnetometers with the option of a lighter and slightly narrower electronics case specifically for UAV applications. Besides being lightweight, the potassium magnetometer is ideal for UAV applications due it the industry leading sensitivity, and negligible heading error. In gradiometer applications the base line (distance between sensors) is very important. The larger the distance the better, since the signal/noise ratio is increased. However on UAV gradiometer applications this wingtip distance is quite short, so it is even more important to have magnetometers with a very low noise levels. The k-mags have the lowest noise levels in the industry and are thus ideal. Modern Mag manufactures our own cases for GEM systems magnetometers, and have engineering CAD diagrams and capabilities to fit a magnetometer on your UAV platform. We would be glad to assist. Modern Mag is an official GEM Systems Advanced Magnetometers agent. Feel free to contact us for more information. How heavy ? Intending to use an octacopter . Hi, this is Vahid Ghobadian, Master of geophysics from Iran. I work for a geophysical survey company (mineral exploration) in Iran. We are very interested in your unmanned aircraft systems. I want to know more about your products especially UAV system and how we can buy it. This email is to request you for a brochure which provides an introduction and details about the prices and advantages of using UAV systems in geophysical surveys. GEM systems sells the most advanced and accurate magnetometers in the world. The potassium magnetometers are ideal for UAVs. They are the lightest magnetometers. A lot of people want to put magnetometers on UAVs. There is no turnkey (ready made) system that anyone can buy. People build them from a lot of different parts that they choose themselves. Place particular emphasis removing as much magnetic material from the UAV as possible, a long wingspan, the data acquisition system, and the magnetic compensation system. To build such a system you would need a collaboration between a geophysicist, an electronics engineer and an aeronautics engineer -in that exact order of importance. The geophysicist will soon tell you that the GSMP-35 is the best magnetometer for UAVs. Feel free to email for quotations and more details about what is so good about the potassium system for UAVs -Justin. We built a UAV Mulitcopter mag system and have been flying it 6 months before the Gem Systems UAV (still waiting for their first system to be ready for production sales) was announced at PDAC 2015. We use a hexacopter and the GSMP 35A sensor. Have flown over 600 line km so far, and it is flawless. Total cost : less than 100,000 CAD. Michael. Vahid, we’d be happy to help you out. Hello Michael. Does seem like you where the first to market with a heli system. Some people have tried the Yamaha RMAX in the past and failed. There is a startup company here in Australia hot on your heels with a larger quadcopter with greater payload and endurance. They are towing the bird. How did you handle magnetic interference (noise) from the aircraft and how are you controlling the GSMP35A and storing magnetometer and GPS data? [Edit] I now see from your website that you did not handle the noise. A 2nT noise envelope is very bad/noisy. A GSMP35A is capable of 0.0003 nT. You mustn’t be towing the sensor or compensating for the magnetic noise in the aircraft. I also note the comment “[sensor resolution] benefits from lower noise than walk-mag surveys due to increased distance from anomalies.” Ground mag always has better resolution than air mag. The anomaly signal is harder to see as you fly higher. Both signal and noise is attenuated by flying higher. Granted the noise is attenuated faster but upward continuation filters handle that in a loss less manner. I suspect your cost estimate does not include you or your colleagues time to develop the technology.